Hurricane Sandy had a remarkable effect on the structure and vegetation of many of the Harbor Herons nesting islands, particularly Hoffman and Swinburne Islands in the Lower New York Bay. Despite the destruction of considerable nesting habitat, the Harbor Herons are back in large numbers throughout New York Harbor this year; in comparable, and in some cases greater numbers of nesting pairs than observed before the storm in 2012! Islands including Hoffman, South Brother, Mill Rock, and Subway continue to support vibrant communities of herons. Unfortunately, other islands, including Canarsie Pol and Goose Island, have experienced drastic declines. 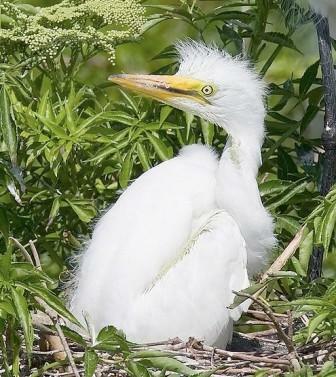 Canarsie Pol, once one of the largest and most diverse nesting colonies in the harbor, has now been completely abandoned by all colonial waterbirds. Goose Island, which exhibited active heron nests earlier this spring, has also been recently abandoned. In both cases, evidence points towards mounting disturbance, both from humans and from predators such as raccoons, rats, and other birds including owls and crows. The situation on Goose Island this past week can only be described as a massacre, with eggshells and dead adult herons and egrets strewn about the forest floor. Human disturbance causes adult birds to leave their nests, likely aggravated the effects of predation by making eggs and chicks more vulnerable to predators. Goose Island illuminates the true cost of human disturbance in nesting colonies during the breeding season, and the importance of predator-free nesting habitat to the perpetuation of colonial waterbird populations in New York Harbor.